I've had my fair share of 'wanderlust disappointments' — scrolling through fascinating instagram feeds only to find out that the place which I thought was amazingly beautiful, was probably enhanced. I've kept my expectations to an all-time low when visiting Japan in autumn. After all, it's easy to enhance the colours of autumn leaves... just add saturation and viola, the place looks magical. However, I was surprised that Shinjuku Gyeon remains exceedingly beautiful with my naked eye. 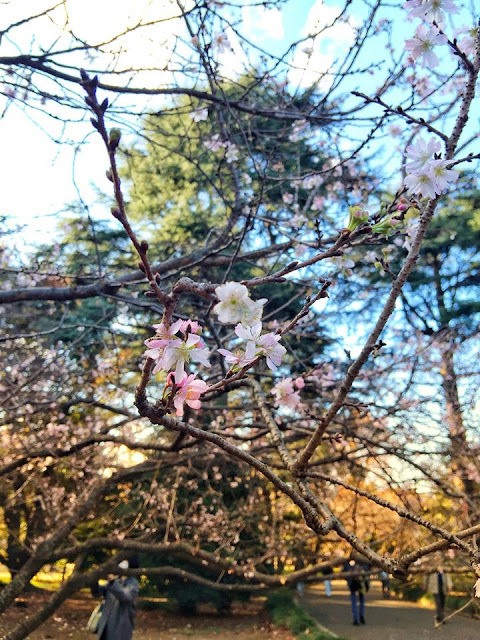 It was an easy stroll at Shinjuku Gyeon, albeit the weather was outrageously cold. You're advised to wear all your heat-tech and thermal wear if possible, because there is no way to hide from the wind in the garden. I was there with my parents (my brother was away for a wedding photoshoot), and there were a lot of benches which allowed us to rest. There's no food stops in the garden (or maybe there is, but we couldn't find any), so do have your fill before heading there. There's something extraordinary about this park which glows in the setting sun. Everything turns yellowish gold and it looks really beautiful in real life. Our family had so much fun taking photos — we even lie down on the grass and look at the sky!